It is a newly released 3D VR Helmet, which supports many smartphone models with Android and iOS system. Put your phone into this VR Shinecon, you can enjoy a super great screen of 3D effect. No need to go to cinema. You can also play 3D games with it, which creates you a great immersion experience. Phone Supported: Screen size from 3.5" to 6.0", Phone width less than 82mm, length less than 154mm. Kindly Remind: The surface of this Shinecon VR is matte, NOT smooth. It provides you good 3D Virtual Reality Immersive experience at very cheap price. [Leelbox Brand] As a professional Manufacturer of android TV box, we devote to making the boxes of high quality and multifunction. Therefore, we are fairly popular with local people. [Leelbox Warranty] Our boxes have a free 4-month warranty. [Leelbox Tech Team & Service] We own a smart technique team. We promise to serve you with more and more professional tech supports. We always pursue to offer you the best service, no matter whatever and whenever. [Leelbox Customer Service] We always pursue to offer you friendly and best service, no matter whatever and whenever. 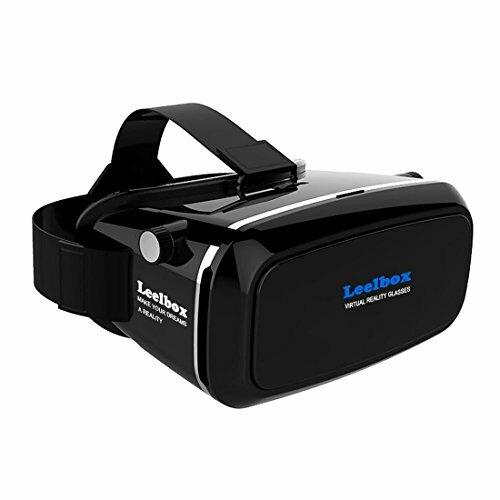 [Leelbox VR Glasses] Larger Screens Better Feeling for you. Fit for Smart phones of 3.5 inches to 6 inches, the best size is 4.7 inches to 6 inches (the maximum length* width of phone is 4.62 X 2.46 inches). VR glasses is better designed and very great for 3d Movies. When you use it, you need to download an app supporting 3d output in your phone. If used for games, you can buy a remote control for your phone.